My new old record cabinet! Is it repetitive yet, my stories about sourcing and polishing up old finds? I feel like it might be. Step 1: Steph finds some old piece of junk on Gumtree or out of a salvage warehouse (tip shop, is the local term). Step 2: Steph cleans up said old piece of junk and gives it a reason to live. Step 3: Steph posts photos of the process on her blog and gives herself a bunch of back-pats. Now that that’s established, here’s the latest delightful piece of garbage I brought home: a veneered chipboard ‘60s cabinet with sliding doors. I’ve been in the market for a little record cabinet for a while now, and bar the missing veneer in places, this one was in excellent condition. Once again, I brought it down to my favourite place in the world for these projects: Jamie’s father’s bush property. No one cares about noisy power tools in the bush. It encourages me to focus; either I finish by sundown on Sunday, or I get to wait until the next Sunday. There’s always people around, and I often get advice or help when I ask. Absolute godsend. There’s often a specialised bit of gear lying around somewhere that makes life easier. So yeah. With this cabinet, the varnish was shot. It was scratched and faded, and bubbling where it had been left in the rain. The veneer was (mostly) in good shape, though, so I thought it’d be worth stripping back the old crappy varnish and applying a new finishing coat. My materials list for this part: an orbital sander, 40/120/240 sanding pads, cleaning rags, clear satin varnish and a brush. Random orbital sanders, by the way, are worth every penny. They knock out sanding jobs so smoothly and so quickly. Here’s how it looked when the outer shell was sanded back, which took off the old varnish and orangey stain. I took off the doors and sanded them too, but the bottom frame only needed a little furniture polish. After going through my coarse to fine pads (40 – 120 – 240), I wiped off the dust with a clean damp rag, let dry, then applied poly with a brush. (Mine was British Paints oil-based satin gloss.) No stain this time, since the veneer has enough colour and interest. Adding new veneer was the dicey part. For this I had a pen and ruler, utility knife, PVA glue and some veneer, obvs. I cut back the peeling veneer to where it was whole again, slicing crossways with my knife and then carefully prying off the broken section. I also saw iron-on edging on ebay which would have cost the same amount, and honestly, I feel like I should have gone that route here. Gluing on this stuff was a drag. The veneer sheeting wasn’t perfectly flat, even the little pieces I had cut to size, so I had to hold it in place. Despite my efforts to rig something up with clamps, I had to keep pressing it down with my fingers splayed all across it, counting to 60 and seeing if it would stick yet. So difficulty, much craftsmanship, many professional. Anyhow. Once the glue dried and cured for 48 hours, I sanded back the rough edges and glue spots. It’s an imperfect job, but it’ll do me. 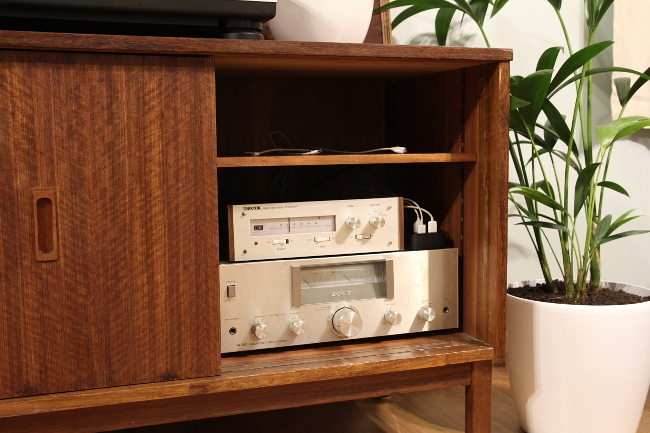 With the cabinet shell all fixed up and brought back to our house, my goal was to turn it into a tidy little media centre for our turntable. One cord coming out the back and the rest of them tucked neatly inside. How good is that? Before drilling any holes, though, I drew up a diagram of how all the electronics – turntable, stereo amp and radio tuner – connected to one another and to the power outlet. This was so I could work out where the important cords would go and demonstrate to Jamie exactly what I was thinking about. The idea was to have all the electronics plugged into a single powerboard, which would snake out the back and plug into the wall outlet. With a better understanding of the cables and cords in mind, I drilled a 35mm hole in the back, which snugly fits small plugs. The back piece is only a thin sheet of veneered plywood, maybe ¼” thick, and I used a spade bit because it would cause less damage to the fragile veneer. I had a brainwave on what to do with the shelf above the amp and tuner: it could be a USB charging station! I wouldn’t have to go on a scavenger hunt every time I needed to charge my Kindle! What a plan! To make this happen, I got a powerboard from JB Hi-Fi that has four USB outlets on one end. All I had to do was drill a ¼” hole through the inner shelf, and the USB outlets could snake through and hang out on the shelf above. Time to dissemble my previous setup and re-assemble it in the new cabinet. Now, this old cabinet was great — it did the job and it fit right in at our old apartment. Here, though, its size and shape felt dinky and wrong in the living room. I also wanted a cabinet with enclosed storage space for records. So off it went to a new home. Here’s how the whole shebang came together! Isn’t she pretty? Everything fits in beautifully. It took some mucking around to get everything hooked up to everything else; I hadn’t drawn every cable. But I managed, and I bundled up all the excess cord-lengths with cable ties in order to keep everything untangled back there. The USB charging station has been handy so far, and I’m a little bit proud for thinking of adding that in. I could have made it more elegant and pinterest-ready, I suppose, but eh. After the poly varnish was dry on my cabinet, I gave the whole thing a quick wipe-down with furniture polish. The oil darkened the wood a bit, and the whole thing looks that much richer. No stain added, just the natural colour of the timber. The doors don’t match, but that’s variation in veneers for you. I got this framed batik from an antique shop and I love it. I’m still trying to figure out who and what is going on in this piece, but the style looks a lot like that of wayang kulit, a centuries-old form of Javanese theatre that uses intricately-created shadow puppets. (There’s an orchestra and the performances last for several hours into the night — far out.) Often the characters and stories come from Hindu legends like the Mahabharata. I love the colours and use of pattern, and it’s likely that this is an illustration of part of one of those epics. The record cabinet also holds, wouldn’t you know it, records. I’m a little self-conscious about my paltry record collection because my brother is a musician and songwriter, and I don’t have the encyclopedic knowledge base he does. He’s a good dude, though — he gave me a bunch of classic records for Christmas a couple years ago, and he’s always introducing me to cool stuff. Well, that’s pretty much it. The old crate on the left is now a cat toybox. Important stuff. I’m so glad I replaced and upgraded our record cabinet, and I’m proud of the job I did. Chilled-out Sunday afternoons with records going = good times. That sure is pretty. I’ve been looking for a similar piece but no luck so far. You did a lovely job! Thanks Ana! You never know what you’ll end up taking home. Going to the bush to play with loud tools sounds very therapeutic. Nice work. I’m so grateful that I’ve got a place to work on these things. 🙂 I don’t see myself moving to the bush, but I’m learning to appreciate it more and more. I love it. Lots of style, and the plants and framed batik are perfect complements! Looks so great! Love the plants and the framed batik, adds just the right retro feel! Thanks so much, lady! I think I could happily live in a ’70s plant jungle. Yup. I actually like that the veneer is different on the two doors! It looks very chic and visually interesting! Also, I laughed at “clive palmer” and I love your batik! YAY! “new home” is loving the new addition as a bedside table! (currently with radio, wine, lamp and candles on it) and also was thinking i have a display cabinet that needs some jazzing up if your interested in a challenge?